Pete Ruscitti, the new chair of the Ocean Beach Planning Board, has truly found his groove in heading up the local community planners. With a Masters in Public Policy and a number of internships with public agencies dealing with issues of planning and transportation under his belt, he is a currently a transportation planner for the firm he works for, Parsons Brinckerhoff. Pete is certainly a policy guy. Urban planning is where his heart is – this is what he wants to do. Pete’s meteoric rise on the Board Board for OB has been noticeable. A couple of years ago, while living with his spouse in OB, he decided to go to a Planning Board meeting to check it out – since that was his thing. Once at the meeting, Board members informed him there was a vacancy on the Board and encouraged him to run and be appointed. He jumped at the chance. So, in April 2012, Pete was appointed to his first seat. He so impressed his colleagues on the Board, he was chosen as Vice-chair during his second year. The vice-chair runs the important Project Review Committee, and has the first pass on any projects that are coming before the full board. And then just recently, as former chair Tom Gawronski stepped down, Ruscitti offered himself – there was no opposition. Pete and I sat down at a local restaurant last Wednesday, just as the Farmers Market got going. I told him I wanted to get to know “the real Pete,” and ask about his personal history. We had limited time, as he had a shift over at the Market to get signatures on the petitions in support of the OB Community Plan. He’s 33 and is married to Melissa, who he met in OB years ago, and she’s expecting their first child in December. She, a Mid-western girl from the Chicago area met him through a mutual friend while Pete was still in the Navy. His friend had told him that ‘hey, you both live in OB’ so while some shore-leave, they met, started dating and got hitched. On the day of the actual wedding, Pete smiled as he recounted it – on March 20, 2011, they were to be wedded out in the open on top of a La Jolla hotel, but nature had other ideas and unleashed its fury with incredible winds and rain – driving the wedding party indoors. Melissa today works for a bio-tech firm up near UTC. He stayed in the town his entire first 18 years – he was an only kid -, and his parents, Pete Junior and Judi, still live in the house where “Pete the III” grew up. His father is a regional manager for a college textbook publishing company and travels quite a bit. Judi, his mom, runs her own accounting business. He has two degrees. He obtained a BS from the Wharton School of Business in Philadelphia; it’s part of the University of Pennsylvania. “It was the best big school I got into,” Pete said. In order to get through college, however, Pete signed up for ROTC and obtained a full academic scholarship. 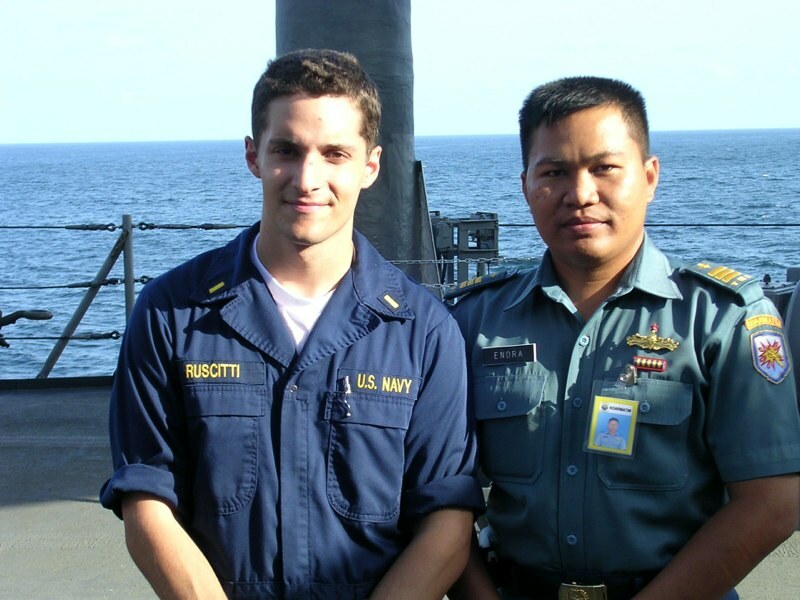 So, for 4 years, he trained as an officer, and upon graduating from college, he went right into the Navy. Many of his college classmates, he said, were scrambling to get high-powered jobs in the corporate world, and he realized that was not what he wanted to do. His first base in the Navy was as an officer on an amphibious ship, based out of a small city in Japan, Sasebo, on the south island of Kyushu. He did that for two years. For his next four years, he was based out of San Diego. He had told the Navy that San Diego was one of his choices. His first assignment once here, however, was being on the staff of a two-star Marine general deployed in the Middle East, in the Gulf. He was in Iraq for 3 months he said, but “at a desk job” and Pete made a point that he didn’t consider himself an Iraqi war veteran. And his first night, Pete stayed at the OB Hotel for the week that he was deployed here. That was it. He moved to the community. His last tour was “an awesome job” as he was an instructor here in town at a Naval gun school. 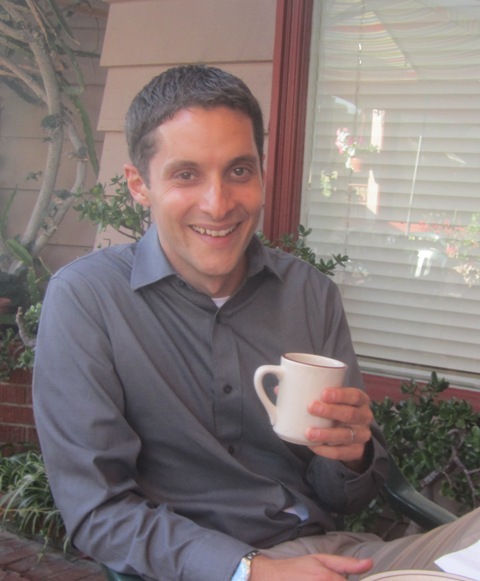 Upon leaving the military, Pete knew he wanted to study public policy, so his next step was to get a Masters from UCLA. He was interested in transportation, and felt he could get his best education at a public school, which was “the best benefit of the GI Bill.” Once at UCLA, he took a lot of planning classes, he said, “and I realized I like planning.” While in the LA area, he had two internships in planning, the first for the City of Beverly Hills, and then he interned for a year with the Southern California Association of Governments. “It’s similar and larger than SANDAG,” he said. 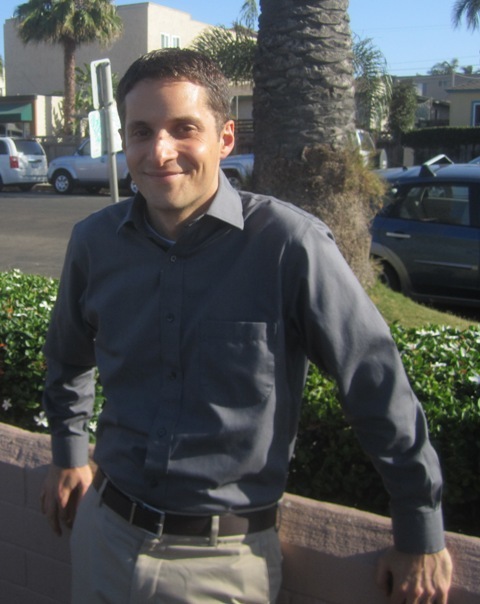 With his Masters in hand, Pete in 2011 returned to San Diego and OB. He had a job with an engineering firm. Melissa had been living here all that time and they had engaged in one of those OB-LA long-distance relationships. The first place they moved to was on Coronado, then they went north to Saratoga Avenue. The couple just bought a condo over on West Pt Loma, Pete said. A recent OB Planning Board meeting. 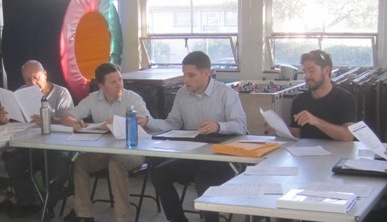 Planners are L to R: Tom Gawronski, Drew Wilson, Pete Ruscitti, and John Ambert. We were wrapping up the interview. “I feel honored,” Pete said about serving on the Planning Board. “I was in the right place at the right time,” he said about his rise on the Board. “I like to bring both sides to the table. I’ve seen it happen in the 2 years on the Board,” he said. He rose, we shook hands and he rushed out to the busy Newport Avenue to do his shift in collecting signatures. Nice article. Pete is doing a great job. Pete is better looking than the picture. Must be the lighting!